NOTE: in order for an accepted paper to appear in EMMCVPR'11 proceedings (LNCS), at least one of the authors should complete a regular registration (not a student registration!) before June 15. This requirement helps to reduce uncertainty for the conference budget. It also makes possible a significantly lower student regisration fee encouraging larger participation from each contributing research group. Early-bird registration fees (before June 15) are as follows: regular - 400 Canadian dollars (approx. 290Euro), student - 260 Canadian dollars (approx. 185Euro). Both regular and student registration fees include access to the conference room and atrium, light breakfast and coffee breaks on each day of the conference, wi-fi access at the venue, social event (banquet), and USB key with LNCS proceedings of the conference. If needed, hard copies of the proceedings can be purchased directly from Springer (any EMMCVPR paper author can request a token for 33% author discount). You can register for EMMCVPR using your CREDIT CARD after pressing one appropriate Pay Now button below. All transactions are processed via PAYPAL server. Note that a PAYPAL account is not required, but in case you have one you can use it if you like. Follow two simple steps and other instructions below. 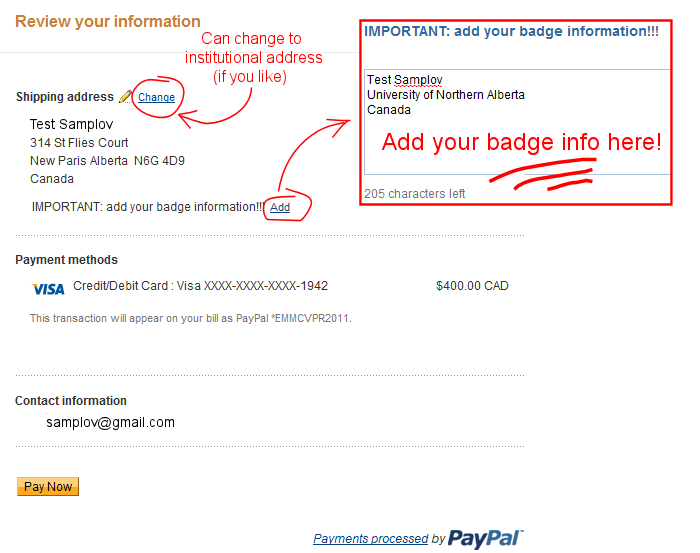 Make sure to add your badge info after entering credit card, clicking Review and Continue, but before clicking Pay. In case you are paying to register someone else, it is enough to specify their correct name and affiliation for the badge. (Step 1) Press an appropriate Pay Now button at the bottom of this page and follow a preferred payment option (e.g. credit card or PAYPAL). EMMCVPR receives only your name, email, payment amount, and shipping address. No confidential credit card information is transferred to us. Make sure you enter your email address correctly. PAYPAL sends your registration confirmation there. We may also use it for communication. Click on Review and Continue to proceed to step 2. (Step 2) Click add to specify your name, organization, and country as you want them to appear on your badge. 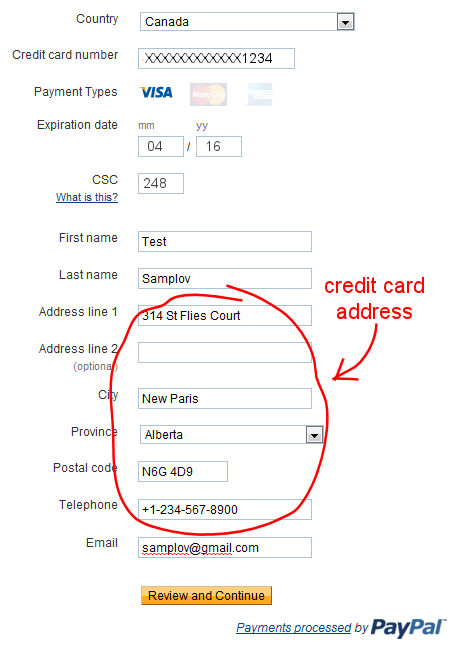 The default "shipping address" is the credit card address. You can add any other address (e.g. institutional) to replace the default. A receipt can be printed from PAYPAL's web site at the end of the transaction. You can also print PAYPAL's confirmation email. We do not mail hard copies of registration receipts (by default). Please contact emmcvpr11 'at' csd.uwo.ca if you have questions. Each regular or student registration includes only one banquet ticket. You can buy extra banquet tickets using a separate button below. Use the same name and email addres as in your conference registration to receive your extra banquet tickets in your registration desk package.